This steak knife is perfect for any restaurant, bar or steak house. It boasts high-quality construction in a signature classic design. Featuring a 5" long serrated blade which is paired with an ergonomic handle to create a truly functional utensil ideal for any occasions. The comfortable grip of its black plastic handle and the durable, sharp extra heavy-weight stainless steel 18/8 metal adorns the blade, and a reliable design makes this knife ideal for slicing cooked, rare, or well-done steak effortless. 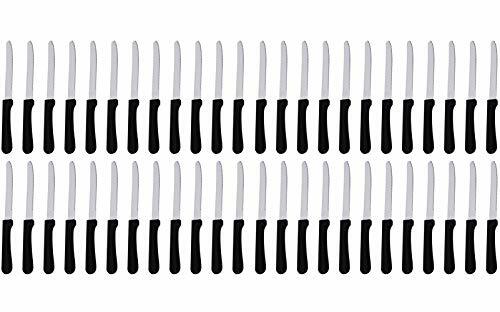 COMMERCIAL QUALITY: Made of High-Quality Stainless Steel, Rounded Tip Blade with Serrated Edge cuts easily through any meats. Ergonomic plastic handle that provides a smooth, comfortable grip as well as an attractive appearance. NO SHARPENING: With a Stainless steel serrated knife blade you can forget about sharpening and corrosion once and for all. It provides an effortless slicing and reliable, long-lasting performance. STRONG & DURABLE: Weighted for stability and control this steak knife has an improved balance and control when cutting . Overall balance of this Knifeprovides you with the best feeling when holding and cutting meat, while its simple and elegant design easily coordinates with any of your existing flatware patterns. VITAL FOR RESTAURANTS, STEAK HOUSES or DINNER PARTIES: This steak knife with a refined and elegant style is a perfect ancillary in any thriving restaurant or steak house. Add classy look to any well-set table with this high-quality steak knife. Ideal for everyday use. DISHWASHER SAFE- HAND WASH RECOMMENDED! Dimensions: Blade Length: 4 3/4", Handle Length: 4" , Overall Length: 8 3/4" . If you have any questions about this product by Tezzorio Tabletop Service, contact us by completing and submitting the form below. If you are looking for a specif part number, please include it with your message.